The purpose of this paper is to investigate the life and theology of John Calvin (1509-1564). 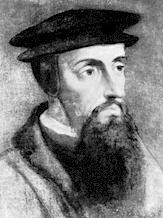 Calvin was perhaps the most influential leader of all the great leaders of the Reformation era. Calvin’s biblical and theological writings are the main reason for his continuing influence to the present day. He wrote commentaries on every book of the Bible except the Song of Solomon and Revelation and his Institutes of the Christian Religion was the dominant systematic theology of the Reformation. The Institutes are still regarded as the authoritative expression of Reformed theology. For these reasons the study of the life and theology of John Calvin is vital if we are to understand the essence of Reformed theology. To read the paper in its entirety click here for a pdf version. ← Happy 1st Birthday, Jonathan! Hi, I saw your articles on “The Minor Prophet”, and thought you may be interested writing to us about Bible verses/passages that have recently impacted you. Our site is http://www.shareyourstorynow.org. Look forward to hearing from you! Never heard of this fellow Calvin… was he important or something? Steve, I just read this over lunch… great paper. Thanks for sharing!